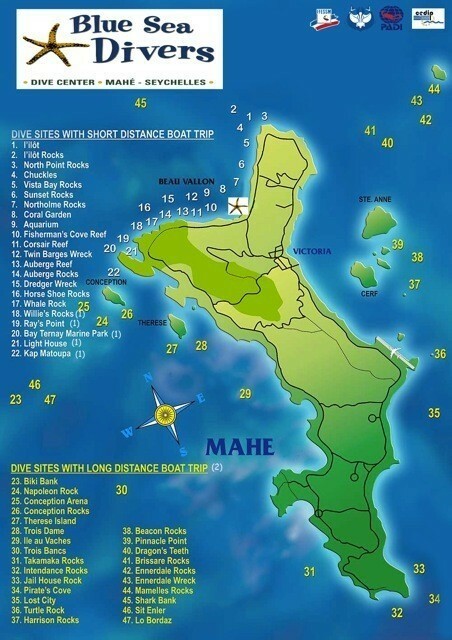 With more than 50 dive sites to choose from, Mahe diving is some of the most diverse in the Inner Islands. Famed for its stunning underwater topography, with coral covered granite slopes and impressive structures formed by giant boulders, diving in Mahe is not to be missed. Home to a myriad of tropical underwater species, as well as a few shipwrecks, Mahe also plays host to the illusive Whale Shark – the world’s biggest fish – which often graces the islands with its presence during October/November. With several dive centres operating on the island, our selected diving partners are some of the best in the business. Blue Sea Divers, based right on the beach in Beau Vallon, is ideally situated for access to Mahe’s northern dive spots and wrecks, while down in the south Dive Resort Seychelles services all the major resorts and is the best place to avoid the crowds. See below for more information on our selected diving partners. From their beachside base, right at the heart of Beau Vallon, our selected diving partner - Blue Sea Divers - is perfectly located for access to some of Mahe’s most beautiful dives sites. Blue Sea Divers offers daily diving trips and a full range of diving courses as well as snorkelling excursions. At Blue Sea Divers you’ll be able to dive at your own pace with the choice of full day or half day excursions. Groups are kept small with supervision always being provided by qualified professionals at all times. And for those not staying in the immediate vicinity, they also offer free transportation between your hotel and the dive centre. Blue Sea Divers also boasts their very own diving liveaboard….. “Galatea” - see below for more details on their diving cruises. Diving in Mahe; both full and half-day diving trips to some of the best known dive sites around the island. From the Blue Sea dive centre on Beau Vallon beach they head out each morning at 9h00 for two dives, arriving back at the dive centre around 12h30. For their afternoon dive they leave at 14h00 getting back at about 15h30. Dive sites are selected day by day, with weather and sea conditions and level of certification playing a role in the selection process. The majority of dives sites along Mahe's northwest coast are only a 15-20 minute boat ride away (Short Distance), with sites further afield (Long Distance) taking a little bit longer to reach. Click here to see a map of all dive sites. Affiliated with both European and International diving organisations (PADI, FFESSM, CEDIP, and CMAS), the qualified multilingual instructors at Blue Seas Divers are waiting to take you on a voyage of discovery. Their adaptable educational programs will take you from your first breaths underwater, all the way up to professional accreditation. Not sure which course is for you? Whether you’re completely new to diving or looking to improve your diving skills and knowledge, Blue Sea Divers can advise you on the most suitable course to follow. The team at Blue Sea Divers is pleased to welcome you and are always on hand to help you make the most of your diving experience. So why not join them on one of their 10 or 12 metre boats and let yourself be guided into discovering the rich diversity of Seychelles’ marine life. This season, Blue Sea Divers is proud to introduce its very own diving liveaboard - “M/S Galatea”. Experience the beauty and diversity of the Seychelles aboard this 30 metre schooner, purpose built for Mahe diving cruises, which can accommodate up to 14 passengers and boasts seven spacious air-conditioned double-cabins; every detail designed with comfort in mind. Departing from Mahe you’ll cruise the turquoise, emerald green and deep blue waters of the Inner Islands, taking in some of the best dive sites in the region. To celebrate the launch of their Mahe diving cruises, Blue Sea Divers is offering 10 FREE DIVES with every 7-night cruise and 6 FREE DIVES on their 3-night cruises - conditions apply. 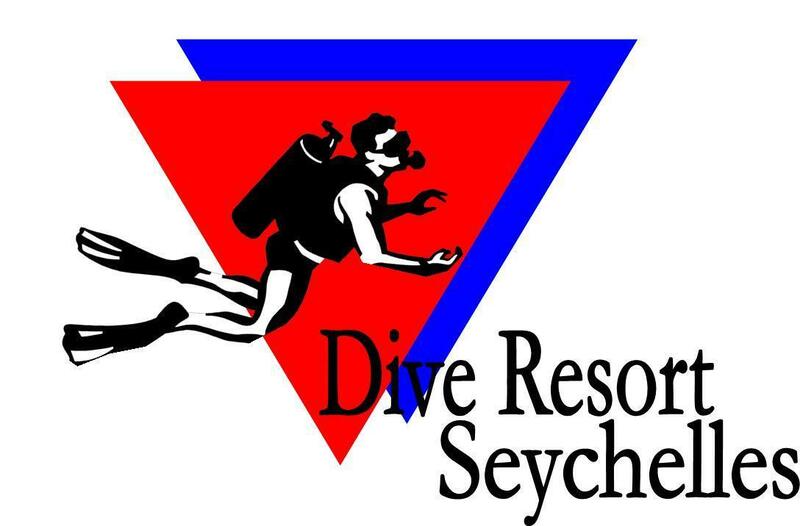 “Avoid the Crowd - Dive the South” For anyone staying in the south of Mahe, our recommended diving partner - Dive Resort Seychelles - is the ideal choice for those wishing to explore some of Mahe's best-kept Mahe diving secrets. Join Leo Hoevers and his team of experienced guides and instructors, whose aim is to encourage people to discover the magical underwater realm of the Seychelles in a relaxed and safe atmosphere. With dive centres based at the Four Seasons and Kempinski resorts, in addition to their main dive base at the beautiful Anse La Mouche, Dive Resort Seychelles is perfectly located for access to some of Mahe's lesser known dive spots which, due to their location, offer divers a unique opportunity to get away from the crowds sometime associated with the island’s more northerly dive sites. Their 5-star PADI dive centre is just a stone's throw away from the beach, where their boats await to take you on your next exciting scuba diving adventure. They offer a wide range of PADI dive courses from the very popular 1-day “Discover Scuba Diving” experience for absolute beginners, including children, all the way up to the more demanding “Divemaster” course. Courses can start at any time and are tailor-made to fit around your holiday schedule as much as possible. For certified divers, the highly experienced team at Dive Resort Seychelles are ready to guide you to some of the most exclusive dive sites around Mahe. They know all the best spots and love diving them, so why not let them show you why they are so passionate about diving in Mahe, the Seychelles. The underwater topography of southern Mahe is a varied landscape of pristine coral reefs, gigantic boulders and granite slopes and pinnacles that all attract their own variety of marine life. Choose from over 15 spectacular dive sites, such as Stalk Patch - an off-shore pinnacle that attracts pelagic tuna and schooling Barracuda, Shark Point - with its swim-throughs, Reef Sharks and Eagle Rays and not forgetting Oscar‘s Reef - a collection of unspoiled soft and hard corals teeming with reef fish. The Seychelles boasts some amazing marine life from the smallest of sea creatures to the world’s biggest fish - the Whale Shark! Placed right on the migratory path of these majestic beasts, visitors to Mahe are often graced with an encounter of one of these wonderful animals as they make their way through their feeding grounds. Dive Resort Seychelles collaborates with the Marine Conservation Society Seychelles (MCSS), who organise whale shark research trips during the ‘season’, which usually starts in September and runs until November, with peak sightings during October each year. With the aid of a microlight aircraft the whale sharks are first spotted. Groups of snorkellers are then taken out to the sight by boat and, under the guidance of a marine biologist, are allowed to enter the water while the whale shark is tagged. All proceeds from these special excursions go to the MCSS to support their activities as part of a worldwide monitoring process. So why not make a visit to Mahe's south-coast part of your Seychelles Island Hopping itinerary. Even if you’re not staying in the area, you’re always welcome to drop by the team at Dive Resort Seychelles. Appreciated for their professionalism, high standards and quality equipment, they are committed to preserving Seychelles’ marine environment and work hard to protect it. Groups are kept small to ensure divers get the most out of their experience without compromising on safety, with each dive guided by one of their highly-experienced PADI professionals.